Hey everyone, sorry for the long hiatus, but I return this week with new finished artwork for https://joedichiara.wordpress.com. 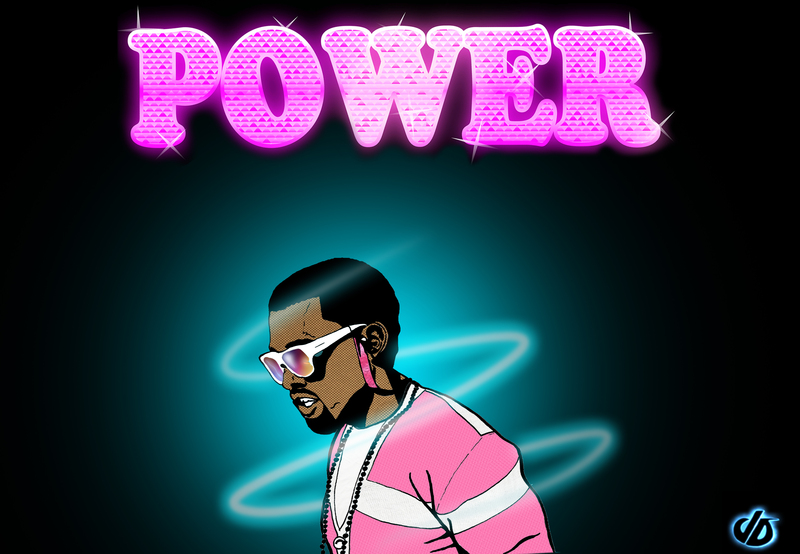 This week’s illustration is of rapper Kanye West. Last weekend Kanye performed “Runaway” on the MTV Video Music Awards. This is a song that toasts “scumbags” a persona West has infamously gained since his encounter with Taylor Swift. Kanye West’s new album is to be titled “Dark Twisted Fantasy”, and the first single from the album “Power” is increasingly gaining attention. A clip was released of the music video, and from an artistic viewpoint it is a very clever and visually appealing concept. Here is my illustration of Kanye West’s “Power” which explores a more digital style that I have been experimenting with. Since It relates to this week’s post I have included a illustration I did of Kanye West and Taylor Swift about a year ago, and the clip mentioned above. Be sure to check back to https://joedichiara.wordpress.com this week along with http://www.joedichiara.com for more updates and additional art!